Irish polo shirt features an embroidered shield in the colors of the Irish flag along with a green on green Ireland design. 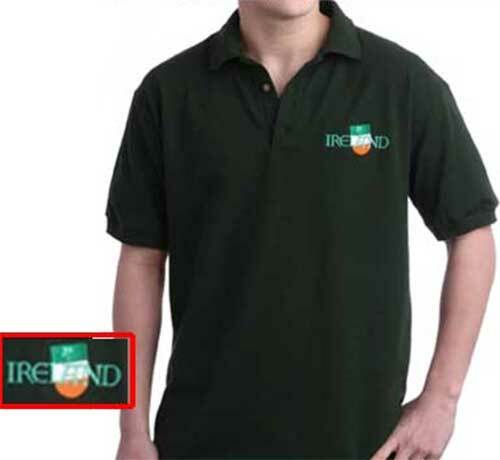 The Irish flag polo shirt is a retired design that is limited to stock on hand. This 100% cotton Irish polo shirt features an embroidered design that includes a green, white and orange Irish flag shield that is accented by a shamrock and the word Ireland. This forest green Irish golf shirt has a three button placket along with wood tone buttons and is available in adult sizes small through XXL. This Irish sport shirt is ideal for casual wear or a round of golf and it is received with a shamrock history card, complements of The Irish Gift House.